What’s your job title and what do you do during a typical day at work? I’m a self-employed clinical hypnotherapist, Reiki master/teacher and certified HypnoBirthing instructor. There’s no such thing as a typical client. I work with people from many backgrounds and nationalities – mainly expats, but also some Danes. A typical day could include a hypnotherapy session for anything from overcoming fears and phobias to turning a breech baby to a head-down position ready for birth. This could be followed by a Reiki treatment for relieving stress, and then a Skype session with someone who can’t get to my clinic easily (for example a new mum or even someone living abroad), all rounded off by teaching a HypnoBirthing class to a group of expectant parents. What’s the best thing about working for your company? I really appreciate the flexibility of being self-employed, but basically I love my job! It’s a real privilege to work so closely with people and to feel like I can hopefully make a difference. Amazingly, it’s sometimes the smallest things that can bring about the biggest changes. For example, I work with SleepTalk, which is a program for improving children’s self-esteem. It only takes parents a few minutes each night while the child is asleep and yet it can resolve behavioural problems, bed-wetting and speech difficulties, as well as reduce sibling rivalry and increase overall confidence. This in turn impacts and improves the wellbeing of the whole family. It’s about seven years since I started my business, Florescence Hypnotherapy, HypnoBirthing & Reiki, here in Copenhagen. Originally it was an internship at a large Danish engineering firm. It was love that kept me coming back though! Back then it was really hard to find student accommodation, so I ended up living at nine different places over an eleven-month period. The final place I lived, I met my now-husband! The UK (I’m British), Japan, Sweden, Greece and for a very short period in Ecuador while I was backpacking. One thing I’ve learned while travelling and living abroad is that there’s more than one way to do anything, and nothing is right or wrong. The work/life balance. I’m sure everyone says that, but it’s so true! For most of us, the commute to work is very short and we can get home and spend time with loved ones, focus on hobbies or both! What do you like most about living in Denmark? You’re never very far from the coast and the water is so safe to swim in – I love swimming in the sea! I would love to do more winter bathing; it’s so invigorating and really makes you feel alive. Over the summer I swim whenever I can. It’s often said that the working environment in Denmark is relatively informal and relaxed. Is this the case at your workplace? I hope so! 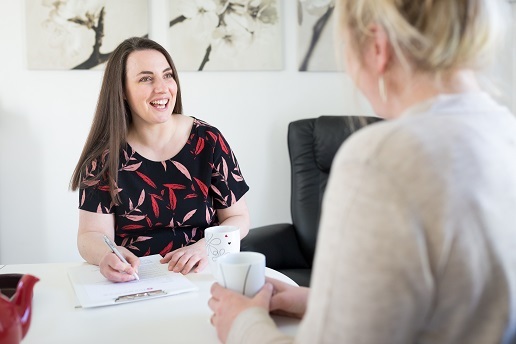 My clinic is not very clinical – my intention is for people to feel relaxed and at home whether they come for phobia or stress therapy, or to prepare for the arrival of their baby. Are you aware of any stereotypes about Denmark and the Danes? How do these compare with reality? As a Brit who speaks Danish and has been here for a number of years, I find I’m still getting used to the Danish directness. People don’t generally “beat about the bush”, to use an English expression! That can have its advantages, yes, but in certain situations I still find myself getting wound up. This straight-talking, of course, is surely linked to being one of the least corrupt nations in the world. What you see is what you get. Danes will tell you what they want, and what they like, and what’s more, they’re used to Danish prices, so all in all it makes business in Denmark a straightforward affair. Did you feel that it was easy as an expat to come to work in Denmark? I was very young when I came to Denmark for the first time. I often think that was a benefit as I was very open and had few expectations. But yes, overall it was easy in comparison to other places I’ve been. Of course, speaking English is a huge help when you first arrive, as no-one speaks Danish before they get here. I would recommend learning Danish once you’ve arrived. I know so many people who didn’t think it was worth it, and personally I feel they miss out on a lot. Also, plenty of expats end up staying longer than they think and then later regret not learning to start with. What would be your advice to someone thinking about setting up on their own? An online presence is essential in Denmark, and I have a love/hate relationship with Facebook right now. I’m no angel, but I like to walk the talk when I can, so I’m getting good at setting boundaries and taking time out at weekends or while on holiday. I have a lot to thank technology for too though – with Skype I can help clients all around the world, and I value contact with colleagues both in and outside the Danish borders. Technology also means that I save money on travel, advertising and study, and that being self-employed doesn’t necessarily require a large investment. Are you involved in any clubs or societies outside of work? Yes, I became a member of LINK (Ladies International Network København) when I got pregnant with my eldest child. It’s great to meet so many different nationalities and I’ve have had a lot of fun, but most importantly found great support though LINK’s subgroup KidsKorner. While pregnant, and once I had a young family, I found that it became ever more important to connect with people in the same boat as me, facing the everyday ups and downs that living in a foreign country brings. And now I’ve been running the KidsKorner Music & Movement class with my friend Helen for almost two years. I take my own children out of daycare to join me and we all have a lot of fun! I also found La Leche League meetings a valuable source of help and support, particularly regarding breastfeeding of course, but also for meeting other like-minded parents. Whatever you’re into, it’s nice to meet people with similar ideas to you as I think it helps with feeling at home. I really recommend anyone new to Denmark to get out and get involved as soon as possible. Whether it’s through meet-up or Facebook groups, or more formally organised groups like LINK, the benefits of meeting other people brighten up even the coldest Danish winter.